On Monday, November 3, 2011, Art Publishing met up with Xavier Prou, a.k.a. Blek le Rat to show him a preliminary unbound version of "Blek le Rat: 30 Year Anniversary Retrospective". 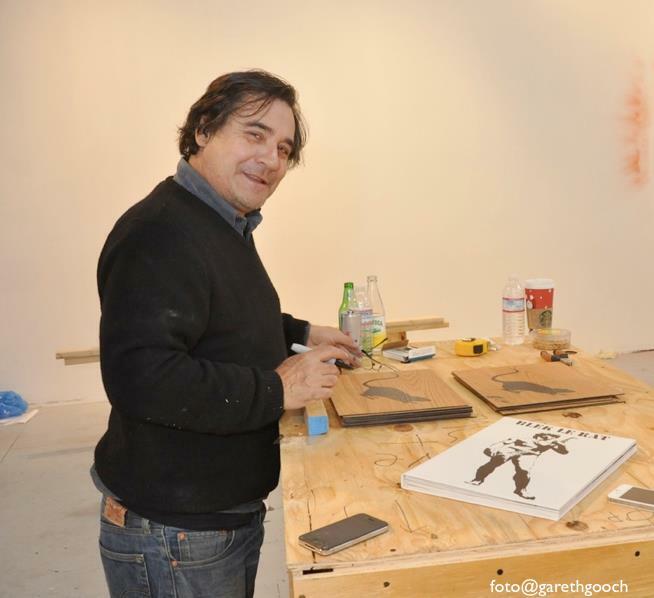 During the meeting, Blek le Rat added the finishing touches to the original artwork that will be included in the deluxe version of the book. Xavier Prou, a.k.a. Blek le Rat views "Blek le Rat: 30 Year Anniversary Retrospective" for the first time. Xavier Prou, a.k.a. Blek le Rat signs the original artwork included in the deluxe edition of "Blek le Rat: 30 Year Anniversary Retrospective"